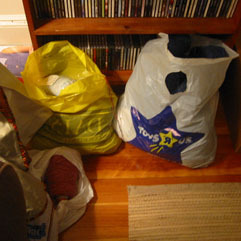 As I mentioned in the last entry, we had a yarn swap last weekend at the Knitsmiths and boy did I make out like a bandit. It's taken me this long to even mention my haul because I can't get over the feeling that I ended up with way more than I should have. It's pretty embarassing, really. Posted by shannon at September 21, 2003 10:52 PM | For related posts: Knit Gringa, Knit!